Noah Preminger (tenor saxophone), Jason Palmer (trumpet), Kim Cass (double bass) & Ian Froman (drums). Meditations on Freedom is Noah Preminger’s sixth album. It’s his third featuring this current line-up and it’s a gem. The tenor saxophonist started writing the music for this album on Election Day and, a matter of weeks later – December 17th – went into the studio. Subtly or pointedly, depending on your point of view, the resulting nine tracks are Preminger’s response to political developments the like of which the USA, and the wider world, hasn’t experienced in living memory. Four cover versions and five Preminger compositions are, as the album title alludes to, meditations on freedom, and, for good measure, add democracy, justice and truth. In a world of ‘fake news’ and ‘alternative facts’ Preminger adds to the lineage of musical protest; the music of Abbey Lincoln and Max Roach, Sonny Rollins and John Coltrane. The saxophonist insists: I would never put myself in that category. Others may well place Preminger in the present day vanguard of jazz musicians with something to say. Covers of Bob Dylan, Bruce Hornsby, Sam Cooke and George Harrison work as improvisations in themselves. No prior knowledge of the composer/performer is required, the song titles speak volumes, such as Cooke’s A Change is Gonna Come. Preminger’s tenor is simultaneously fluid and taut, respectful in meditative mode, erupting into full-on tenor madness, that’s the truth. Trumpeter Jason Palmer is similarly on and off the bridle, more technique than most at his disposal. Preminger’s We Have a Dream reaches out to Dr King, 2017 America is bereft of such a pivotal figure. The quartet engages in masterful improvisatory sections on Women’s March, one of many highlights on this Dry Bridge Records CD. Improvisations on a theme abound on Meditations on Freedom. Boundaries blurred, the composed and the improvised at times indivisible. Bassist Kim Cass and drummer Ian Froman contribute fully to the recording. Preminger prefers to record ‘as live’, no booths or headphones, and, as the tenor saxophonist’s co-producer Jimmy Katz observes…with everybody right next to each other just like on the bandstand. 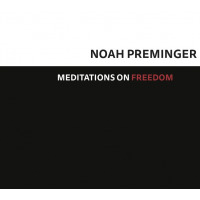 Noah Preminger’s Meditations on Freedom is available now on Dry Bridge Records (005). The quartet will be touring the US in April and beyond. As and when Noah Preminger tours this side of the Atlantic make it a priority to hear him in concert. CD Review - sort of - Tim Armacost: Time Being. CD Review: Jeff Richman - Sizzle.